Vintage ORIGINAL Star Wars 1980 ESB Tauntaun taun taun SADDLE part NO BREAKS! Vintage Star Wars 1980 ESB Ralph McQuarrie Portfolio Print #1 Luke on Taun Taun! Vintage Star Wars 1980 ESB Ralph McQuarrie Print #12 Lukes Flees on Taun Taun! 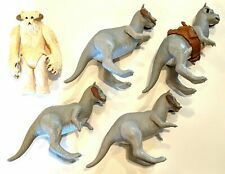 Vintage Star Wars 1980 Tauntaun "Closed Belly" w/Saddle, Reins & Luke "Hoth"
This page was last updated: Apr 25 06:17. Number of bids and bid amounts may be slightly out of date. See each listing for international postage options and costs.